If Rhythmbox leaves you wanting, you might like Banshee. 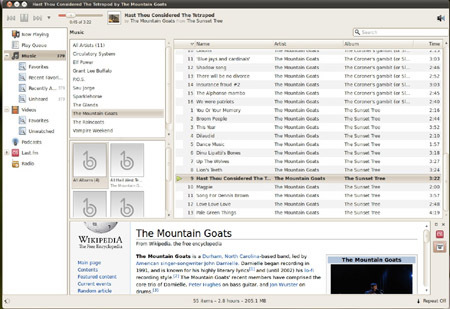 In fact, there have been rumors Banshee may replace Rhythmbox as the default music player in the next version of Ubuntu. Whether or not that happens, Banshee is still a very capable music player and well worth checking out. Banshee looks and acts a bit like Rhythmbox, and if you've used Rhythmbox, you can use Banshee. In addition to features like smart playlists, built-in Last.fm support and the ability manage music on your portable players or phone – though the iPod support was buggy in our testing – Banshee offers Wikipedia access and can search for videos of your favorite artists. Another thing Banshee has that you won't find in Rhythmbox is a video manager. Just like iTunes, Banshee can organize and play your video files. For some, that's moving beyond the music player genre and into bloat, but for others, it may prove a must-have feature. Banshee is the kitchen sink of music players, if someone has thought of a feature, it's probably in Banshee or on the to do list and for those that want the kitchen sink, well, now you can have it. The player's main downside is that it requires Mono, which means installing some extra software. It also may be overkill if you just want to listen to music without all the bells and whistles.